We missed this report being published at the end of last week, but it follows a meeting of members at the Frontline Club to discuss founder Vaughan Smith’s support of Julian Assange and Smith’s decision to give Assange a bail address. At the meeting, which chair John Owen described as “unprecendented”, it’s reported that there was widespread support for Vaughan’s stance, although some concern was raised about his perceived role in the case. The main areas of concern were that Vaughan was seen as a spokesman for WikiLeaks and that the distinction between his personal support for Julian Assange and WikiLeaks and the Club could get lost in the reporting of the story. It was suggested that the Trust should take on the responsibility of the PR and appoint a spokesperson to relieve Vaughan of what had become an “impossible task” of dealing with the press. While there was a great deal of support expressed for the WikiLeaks operation, some journalists were concerned that the Club should be impartial and not take on a campaigning or advocacy position. This entry was posted in Editors' pick, Press freedom and ethics and tagged Frontline Club, julian assange, Vaugham Smith, Wikileaks on February 3, 2011 by Rachel Bartlett. Fascinating piece from Frontline Club founder Vaughan Smith on why he has given WikiLeaks’ Julian Assange a place to stay as part of the conditions of his release on bail. Assange was granted bail yesterday at Westminster Magistrates’ Court, but is still in jail following an appeal of the decision by Swedish prosecutors (background to his arrest on Journalism.co.uk at this link). I ponder the disservice to Julian done by the media. With their stockings stuffed by WikiLeaks they dehumanise him with images printed and screened of a cold, calculating Machiavelli pulling strings from secret hideouts. The main hideout, of course, being the Frontline Club, where many of them have interviewed him. They made him out to be the internet’s Bin Laden. The likeness might be poor, but that was OK because the colours were familiar and bright. Now the focus is on Julian’s court fight, instead of on the opaque political system that his leaks have exposed. This entry was posted in Editors' pick, Press freedom and ethics and tagged cablegate, Frontline Club, julian assange, vaughan smith, Wikileaks on December 15, 2010 by Laura Oliver. Debate raged at the Frontline Club last night as Google and news publishers came head-to-head for a panel discussion on the search engine and its impact on the industry. The very title of the event “Google: Friend or foe of newspaper publishers”, part of the club’s monthly On the Media discussion series in association with the BBC College of Journalism, set the topic of early debate, as Peter Barron, former Newsnight editor and now head of PR for Google UK, sought to banish the idea of the company as an ‘enemy’. “Google is unequivocally a friend of the newspaper publishers. Our aim is to work with them,” he said. Challenged about the ethics of “taking stories for nothing” through the Google News platform, he added that the service followed the free structure of online news. We absolutely we do not steal content. News organisations put their content on the web for free everyday by their own free will and Google helps people find that content. We send clicks to the pages of news websites. We send a billion clicks a month to news websites globally. Once there, those clicks are a business opportunity for the businesses involved. A business which he claims generates revenues of £5 billion worldwide. But the value of a browser who clicks through from Google is minimal, Matt Kelly, digital content director for Mirror Group Newspapers argued. In fact, he said, he’d rather not have them at all. We need to worry a bit less about search engines and worry a bit more about our readers. We weren’t that impressed with the value of audience we got via search engines. They came across it via Google and buzzed off again, that’s Google’s audience. It’s not our audience. We can’t successfully leverage a disconnected audience. He added that many news organisations moving online were “blinded” by the reach the internet and sites like Google enabled them to have. I think they confused reach with audience, they confused numbers with engagement. It was a very alluring thing (…) So we pumped the market full of inventory and there was too much inventory for advertisers to supply. There’s not enough advertising in the world to fill all of the content that newspapers put out online. So what happens is the rate collapses. So suddenly this reach came back and bit the newspaper industry on the arse. So in all this great reach, the rate of revenue coming back from it is in terminal decline. What we would sell 4 or 5 years ago for £8 cpm now we’ll sell it for 80p cpm. This is not a sustainable business model. This is a product of the erosion of engagement that Google brought to news content. Kelly later added that he would rather get one click-through from Twitter than 100 from Google, where someone has said “check this out” and recommended it. “I’m not interested in people who stumble and go, would rather not have them at all,” he said. He said the revenue model for Google focused on making money from advertising and not re-investing much of it into content. Without Google, he added, the world would be a better place for news organisations. Who’s going to pay for the content? Google isn’t going to and why should they? Google helps people find content, however if you imagine a world in which Google didn’t exist and nothing else like it, that world would be better for news organisations (…) The amount of revenue per reader generated online is much less than what can be generated by a print reader. Peter Barron responded to say that the problems for news organisations have been caused by the internet as a whole and that too often people “transpose” the internet and Google. The internet changed the news pattern forever. Thats what has caused huge problems for the news industry. People often transpose the internet and Google. The newspaper industry has faced a huge disruption because of the internet and woke up to it a little bit late. Wired and Press Gazette MediaMoney columnist Peter Kirwan, who was also on the panel, added that many online news publishers simply have their priorities “skewed”. If organisations could cut out the “astronomical” costs of printing, they could begin to think about becoming digital only, he added. The rhetoric that surrounds the idea of the news media exchanging print dollars for digital dimes, in other words (…) the available CPMs (cost per thousand) available on the internet are so much lower than in print – well yes they are – but the cost of putting out newspapers is also astronomically high (…) Strip that out and those digital diamonds don’t look so small (…) News organisations who are currently print dominated could start to think about becoming digital only and I think the rhetoric is now getting slightly tired of exchanging print dollars for digital dimes, we need to move on from that a little bit because I think the possibility of a digital only existence is starting to open up. Looking forward, audience members asked about the future of paywalls and whether news publishers would ever consider building a shared wall. This prompted another panel member, paidContent’s Robert Andrews to ask Barron if Google could say anything on rumours the company was developing a ‘Newspass’ micro-payments system, met with a “no comment” from Barron. Kelly added that it was up to newspapers to map their own future, but for the Mirror Group, it was about ensuring an engaged audience, rather than being obsessed with traffic from “transient visitors”, which he called this “a sickness that has pervaded the industry”. Lots of people used our content but didn’t care about it. We’re trying to get to position B, its free and they care about it but then one day we might get to position C which is that they care about it so much they might be willing to pay for it. I wish [the Times] had gone to position B first and see if they could have engaged the audience and care a bit less about SEO. This entry was posted in Events, Newspapers, Online Journalism, Traffic and tagged aggregation, Frontline Club, google, Google News, news publishers, Newspass, Online Journalism, Search, Traffic, Twitter on August 12, 2010 by Rachel Bartlett. Feel the need for some networking? Contacts book looking a bit bare? 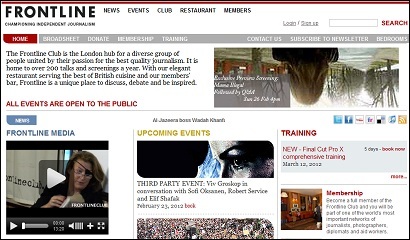 The Frontline Club in London is offering Journalism.co.uk readers a half-price ticket offer for its latest networking party, tonight, Wednesday 21 April. The theme of the evening is original video journalism and the club will be showcasing four unusual, innovative films, including an exclusive preview of a Current TV documentary on South Africa. The event takes place at the club, near Paddington Station at 13 Norfolk Place from 7pm. The first 10 Journalism.co.uk readers to email events [at] frontlineclub.com with “Journalism.co.uk Frontline networking offer” in the subject heading will receive up to two tickets at £10, a full 50 per cent off the normal price (payment will be accepted on the door but advance booking is essential). This entry was posted in About us, Events, Freelance and tagged Freelance, Frontline, Frontline Club, Frontline Club in London, networking on April 21, 2010 by Laura Oliver. Will sorting out the press help push through libel reform? There was a central conflict at last night’s Frontline Club debate addressing English libel and privacy law and super-injunctions. How do you relax legal mechanisms, while preventing tabloids and privacy-intruding publications reaping the benefits? Echoing comments made by Mr Justice Eady in a talk at City University London last month, Carter-Ruck senior partner Nigel Tait claimed that super-injunctions were mainly used in celebrity privacy cases, to protect medical records and former lovers’ revelations, for example. Carter-Ruck, he said, had issued about 12 injunctions in the past year (shockingly, no central record of the number issued exists). To let up on these would be an invitation to the tabloids, seemed to be the implication. David Leigh, head of investigations at the Guardian, finally put his finger on it: there is a problem in his own trade, he said, exemplified by the tabloid treatment of the McCanns. “Unless we put the newspaper houses in order, it’s very difficult to move the debate about libel reform further forward,” he said. As he’s indicated in the past, Leigh believes self regulatory body the Press Complaints Commission to be “a fraud”. A television producer in the audience added that he’d like to see a press complaints commission “worthy of its name”. But science writer Dr Simon Singh, still fighting a legal action pursued by the British Chiropractic Association, doesn’t think this conflict needs to be a huge problem. In fact, making libel law costs cheaper, he said, will allow more people to sue – forcing tabloids to think twice about the things they write about non-celebrities. “Nobody would want to encourage salacious gossip or tittle-tattle,” Singh said. Their reforms address statutory public interest, libel tourism and preventing big companies suing bloggers and individuals. “If you drive down costs massively, what that means is that not only can celebrities sue to protect their reputation but that the ordinary man and woman in the street can sue to protect their reputations. This entry was posted in Events, Journalism, Legal and tagged british chiropractic association, david leigh, defamation, Frontline Club, Libel tourism, Nigel Tait, Press Complaints Commission, privacy, simon singh on April 14, 2010 by Judith Townend.